Your passive wine cellar for all wine information. The wine cellar is the place to keep your wines indefinitely by providing a healthy environment to store your wines. Is wine really healthy for you or this wine and health talk is a myth created by clever marketing? Read this feature about wine and health to find out. Selecting a fine wine is not common task. Obviously the selection of a specific type, year and brand of wine is a matter of individual taste. But differences aside, there are some broad guidelines on which there is agreement, within the confines of price. See which are the possible problems with wine. Sometimes the wine has faults or goes wrong -probably because it wasn't stored in ideal conditions. Cooked or corked? I can tel you cooked or corked, it's all bad. Let us go through a little history, not to be boring but to understand better what wine means today, looking first at the history of wine in the Mediterranean. It is fascinating as wine has been a trading good almost from the very beginning and the Romans with an empire to keep going understood this very well. Consider first if you really need to think about wine storage. If you do, the perfect wine cellar tells about how a wine cellar should be, listing the key features that make an ideal wine cellar. For those that don't have an independent wine storage area should consider wine caves or wine credenzas. If you are thinking about storing wine and already have a especially designed area, a closet or room, you will need some wine cellar equipment. World Food and Wine can point to great books to widen your knowledge about food and wine. Read describing a wine before writing your own tasting notes -personal comments about a wine- or before reading professional wine descriptions to get familiar with all those wine words. Before getting into how the wine comes to be, let’s explore the role of the places and the people who helps with wine making. Winemaking at a glance is an introduction to the art and the factors contributing to a great wine. Making your own wine is fun and an interesting hobby to take. How to make homemade wine will give you a quick glance to the whole process. A literal translation would be soil. But the word terroir refers to the combination of landscape, climate and soil unique to the particular place where a vineyard grows. This combination gives personality to the vines and the grapes they bear. Terroir is a place you can taste in the wine made from its grapes. You could say viticulture is enlightened grape growing, the cultivation of grape vines made into science and developed to great levels of sophistication. Enologists are technical consultants. They do chemical analysis of the wine, maintain yeast cultures, and monitor the aging processes. Which is the role of the winemaker? 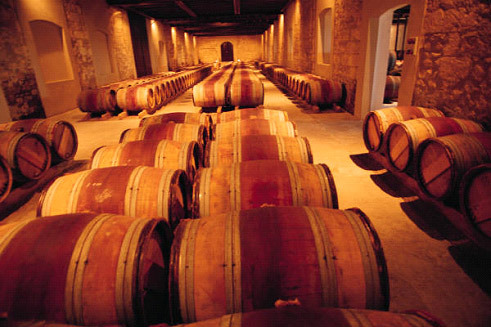 Winemakers are seen, in general, to work in small wineries being responsible for everything from the growing of vines to the distribution of the wines. In larger venues, the winemaker would be in charge of the technical aspect of making wine, very much an oenologist. The winemaker could be some kind of technical consultant who knows every trick to make wines to a certain standard, regardless of how good the grapes were initially. Their work about making wines has much to do with technology and science. What is the job of a winery supervisor? Consider winery supervisors as specialized project or business managers. They direct workers and are in charge of getting the final product to the market... more about the role of winery supervisor. How a wine tastes depends more on the grapes, or blend of grapes, used to make it much more than it does on terroir or winemaking skills. Getting familiar with the most popular grape varieties puts you on the right path to wine expertise as you will be able to predict the flavor and aroma different wines would have just by reading the names of the grapes involved in its production. Find firs the description of the most popular red grape varieties, the ones to give red wines their character, go on to discover the flavors you can get from outstanding white grape varieties. The truth is that good wine requires good grapes but poor wine making skills can turn good grapes into a pitiful wine. This wine cellar is storing something more than wine. We hold other alcoholic drinks - there is a place in this cellar for beer, for instance - and cocktails, mocktails... even alcohol free beverages. Find spirits, of the earthly kind, of course. There is something about whiskey and bourbon, brandy and Cognac, anisette, gin, rum, vodka, or tequila. Practice your technique in wine tasting to bring out the best flavors be consistent in wine appreciation. Have you considered how the shape of a wine glass affects the taste? It does in the same way the temperature and humidity the wine is stored does. See how to find wonderful wines priced within your budget and don't be afraid of choosing wine at a restaurant. Taste a few ideas when it is time to try a new wine. The wine pages on this rack are here while their permanent storage is in the making. Explore Greek wines - a whole new world. Christmas drinks from around the world, to have them handy when we are in season.